“When we are collecting books, we are collecting happiness.” So said Vincent Starrett, the author of this memoir. I agree. I love books about books—that is, authors who write about their love of books, their collections of books, and/or the authors who wrote them. I have an entire bookcase dedicated to them—familiar classics like The Lifetime Reading Plan by Clifton Fadiman, Mortimer Adler and Charles Van Doren’s How to Read a Book: The Classic Guide to Intelligent Reading, overlooked gems like I.A. Richards’s How to Read a Page, and more recent offerings by Nicholas Basbanes like Every Book Its Reader: The Power of the Printed Word to Stir the World, and A Splendor of Letters: The Permanence of Books in an Impermanent World. And no book lover’s collection would be complete without all the works of Washington Post book critic Michael Dirda. I’ve got books about libraries, books about book clubs, and even one about the history of the book shelf. Vincent Starrett was the author of the “Books Alive” column for 25 years in the Chicago Tribune. His memoir, which I first learned about, naturally enough, in Dirda’s Browsings: A Year of Reading, Collecting, and Living with Books (2015), is a charming account of his lifelong love of the printed word that began with his birth above his grandfather’s bookshop in Toronto. He was part of the second wave of the Chicago Renaissance (1910-1925) that included novelists Theodore Dreiser and Sherwood Anderson, poets Carl Sandburg, Edgar Lee Masters, and Vachel Lindsay, and reporters Ben Hecht and Ring Lardner. 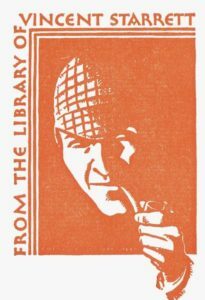 Above all else, Starrett revered two things that I also love: books and Sherlock Holmes. He was one of the 1934 founders of that most famous and exclusive of all Sherlockian fan clubs, the Baker Street Irregulars, along with fellow literary critic Christopher Morley—himself the author of the one of the greatest books about books ever written, Parnassus on Wheels (1917). Get a copy and read it. I’m sure my iPhone and Kindle will both last that long too, don’t you? This entry was posted in Books, Culture, People, Places, Uncategorized on April 12, 2018 by Stan Deaton.